The Lantian Xinjie site is located at southwestern Bianjiazhai Village of Huaxu town in Lantain county. From August 2009 to June 2010, the Shaanxi Provincial Institute of Archaeology had conducted an archaeological rescue excavation at the site. Meanwhile 64 test pits measured 10*10m were arranged and the actual excavation area was around 6000 square meters (some balks were remained unexcavated). Through the excavation, a comprehensive understanding on the cultural deposit of late Yangshao period and early Longshan period of the site is reached. In the excavation, three house foundations, nine pottery kilns, 400 cellar (ash pits), 33 ash trenches and a pit with house bone remains as well as copious amount of production tools, daily pottery wares and adornments were yielded from the site. House foundation F1 dated the late Yangshao period was a rectangular ground structure in west to east orientation. Three ditches (East, West and North) of the house foundation are well preserved and a number of postholes, which placed in sequential order, were found inside these ditches. It is believed that the wall was made of wooden pasting with grass and mud. The living surface was disturbed and the interior of the house foundation measured 9.8m in length, 8m in width with an area around 80 square meters. There were two doors located in East and West sides of the foundation. Near the foundation, reddish burnt clay together with the wall remains was identified. The collapse of the house foundation might be due to fire. Another foundation F2 was a rectangular ground structure (western portion of the house foundation was not excavated) and its southeastern part was broken by a ash pit numbered as H89 of the early Longshan period. The living floor contained five layers of reddish burnt clay and eight foundation earth layers were identified underneath the floor. An oval stove ring was found in the middle of the house foundation and fragments of bottom pointed bottle of the late Yangshao period were discovered inside the stove. The living surface, stove and foundation earth layers were in 30°gradient tilting heavily from north western direction. Traces of sand can also be found in the site. Based on the irregular misplace of stratigraphy and huge collapse of cellars, it is believed that a strong earthquake was occurred during the Yangshao period. One more house foundation of F3 was another ground structure in square shape with circle corner and four wall ditches foundation are well-preserved. Postholes can also be found inside the ditches. The house measured 8.5m in length, 8m in width and its area is around 68 square meters. A large portion of white lime surface with 8-10cm thick was remained in the northeastern part of the house. A round stove with two layers surface was located in the middle of the house. Besides, a rectangular vertical pit was found in the northern part burying with a complete horse bone (need further identification). Preliminary presume it may be the ceremony pit of the house for foundation laying. Six kilns from Yangshao period dispersed with similar shape and structure. Kiln with better condition such as Y6 was in circular shape with 0.9m in diameter and its remaining depth was 0.5m. The burning pit was in strip shape, 1.6m in length, 0.4-0.8m in width and 1.2m in depth. There were three fire passages passed through the kiln. A color glazed layer was formed inside the burning pit and the interior of the kiln. No regular arrangement can be identified in those 346 ash pits from Yangshao period and most of these ash pits were in circular bag shape with small opening. These ash pits contained plant remains. Remains of millet and rice were also identified after conducting the floatation. In this connection, these ash pits were used for food storing cellar. Similarly, no regular arrangement can be identified from the 32 ash ditches from Yangshao period. Most of them were in strip shape and the deepest one is 5m. It is assumed that these ditches were related to the earth picking procedure during the house construction or pottery making. Amount of artefacts were unearthed from ash pits of the late Yangshao period and other remains. The major production tools including stone axe, stone shovel, stone knife, stone adze, stone nail, stone chisel, stone grinder, stone ring cap, stone trowel, stone pestle, stone ball, stone net weight and whetstone. Other tools such as pottery knife, pottery spindle wheel, pottery wheel, pottery figure, bone shovel, bone cone, bone arrowhead and bone needle were also identified. Most of the daily pottery wares have terra-cotta paste or reddish sand-gritted paste; there are also occasional gray (black) sand gritted paste, and a few white clays. Most of the painted potteries are black. 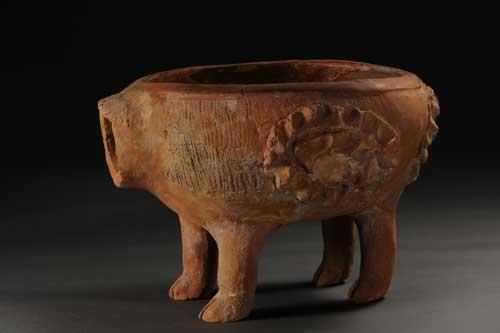 Style of artefacts include goat style ding, pan style ding, pot in bird style, flat bowl, bowl, basin, basin with wide mouth, zeng, pointed-bottom bottle with trumpet mouth, long neck bottle with small mouth, funnel, caldron, stove, jar, urn, large jar, lid and pot stand. Several containers such as ding in goat style and jar in bird style shared the ritual characteristics. The number of adornment was huge including ji made of various materials (jade, stone, pottery and bone), various types of rings (jade, stone, pottery and clam), turquoise bead as well as bone weight in fish style. Other than jade and stone tools, stone grinder and whetstone were also identified together with jade/stone drill core and raw materials. In addition, a number of pottery craft works were yielded. Large amount of animal remains was identified and the classifications of these remains need further collation and research. In this excavation, three pottery kilns, 55 ash pits and 1 ash trench from early Longshan period were unearthed. The style and structure of the pottery kiln were basically identical to the late Yangshao period. The circular bag shape ash pits were dispersed. The opening diameter of these ash pits was around 2.5m and the bottom was over 3m, larger than those from late Yangshao period. The walls of the pit were regular and the bottoms were smooth. Based on the above information, these ash pits might be used for cave living. Copious amount of production tools, daily utensils and adornments from early Longshan period were unearthed. The daily living utensils was mainly coarse grey (black) clay pottery and coarse reddish (brown) clay pottery come second. Apart from plain surface, major patterns including basket pattern, corded and mixed pattern. Representative artefacts including ding, jar, stem cup, flat based pot with trumpet mouth, basin with incised ditch, joint caldron and stove and etc. Animal and plant remains were also identified.